Click here to Shop The Standards. Click here to Customize Your Order. Searching for a green and sustainable lifestyle? 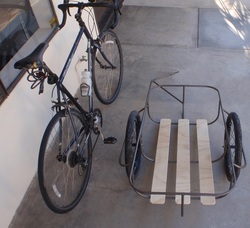 We build convenient trailers for your bike, locally in Santa Barbara. 165 lbs in a 20 lb trailer... amazing strength to weight ratio! Low center of gravity = stability! Click Shop the Standards, "off the shelf" trailer packages that suit the most common customers. Click Customize Your Order if you want to custom build a cart, or shop for spare parts like additional hitches for easier sharing between bikes. TRY YOUR BIKE SHOP! If they don't already carry the Bro-Cart, ask them to contact us! When you're done, click CheckOut on the Google CheckOut icon (it's free, easy, and there's no paypal fee). If you prefer to use Paypal, just EMAIL US, and we'll send you a paypal invoice. A few notes about construction. This site is designed to facilitate the simple configuration and purchase of a low cost, US made product from Santa Barbara, CA. We hope you will find the site easy to use, and the product thoroughly satisfying. Please contact us with feedback, or to get more involved, use the forum to discuss the site and the product. We read our forum! The site will continue to evolve and gain content, and we would appreciate volunteers who are web-savvy enough to help with furthering the site design. Thanks!